I found hundreds of led bulbs on ebay but since it will sit inside the parabolic dish the IR remote might not work ?! 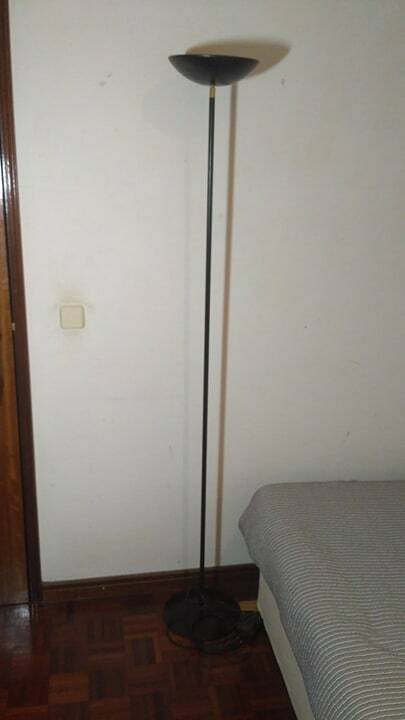 Also, I don´t really know how much watts to use to fully iluminate the room since the light will be projected to the sealing. LED light bulbs are not rated in watts. That is because the same light you would get from a 100 watt incandescent light bulb can be had for around 14 watts with an LED bulb. Mostly they are rated in Lumens, but since many come from China you can really go by that either. They don't exactly tell the truth over there if it would get in the way of a sale. If you want to put one in that lamp, it shouldn't be a problem. I don't know about remote LED bulbs though. I doubt IR remote control would be a problem: it is just light and bounces off surfaces, so it would bounce of a ceiling back down into that fixture... same idea as pointing the TV remote at the wall behind you still working to change the channel under most circumstances. As far as what type of LED bulb to get, that'd be a difficult one. Generally the light from RGB bulbs is not that pleasant at all - i looks white overal, but often lacks in the yellow making things look strange compared to uv-blue led lamps with a phosphor coating. This is fine for accent lights and such, but i would not recommend using rgb lamps as a main source of lighting. Well, I get what your saying, diferent wattages with diferent light sources might produce the same intensity of light. From what i´ve seen, Wattage is used verywhere even with LED Bulbs as "power rating" and due to selling point of view. The only place i see the lumens rating is when buying naked chips or flashlights. Never thought about that, might very well work then. Your´re saying the white is unplesant? Is it noticebly diferent from a standart LED? I use 12 watt LED bulbs. They are about as bright as a 75 watt incandescent. I would expect 15 watts to be about as bright as a 100 watt incandescent bulb. That is for a color temperature of 6200 K, which is a white blue. 5400 K would be a white red. Be careful when ordering. Some are rated for 220 VAC while others are rated for 110 VAC. Don't get them confused. The color rendering isn't that great, at least not in my experience. I installed a meter or so of RGB led strip in my bedroom, controlled by an arduino and IR sensor using some buttons that were not used in my TV remote but did emit IR codes that the TV just doesnt respond to. I figured that'd be perfect since i had the remote already, the ir sensor and clone arduino board are very cheap to get, as well as a generic meter of LED RGB strip. Technically it works perfectly well, using the few unused remote buttons to turn on the strip and vary the brightness, but the quality of the light is not that pleasant. Perfect to find your way around at night, but defentely not something i'd like to be spending several hours a day in. I've had other RGB led strips that have the same issue: the pure colors are very good on them, but combining them to an acceptable white is difficult. Somehow this makes sense since they just lack yellow output, and fairly monochromatic green and red combined just don't render things the same color. 5400 K would be a white red. As a lighting enthusiast this bothers me on so many levels. There are so many questions running through my mind. Wtf is white red? Do you mean pink? There is no pink on the color temperature scale. Maybe you mean yellow-white? That's not the correct term either though - it would be soft-white or warm-white. But EVEN THEN, 5400 is nowhere near warm white. 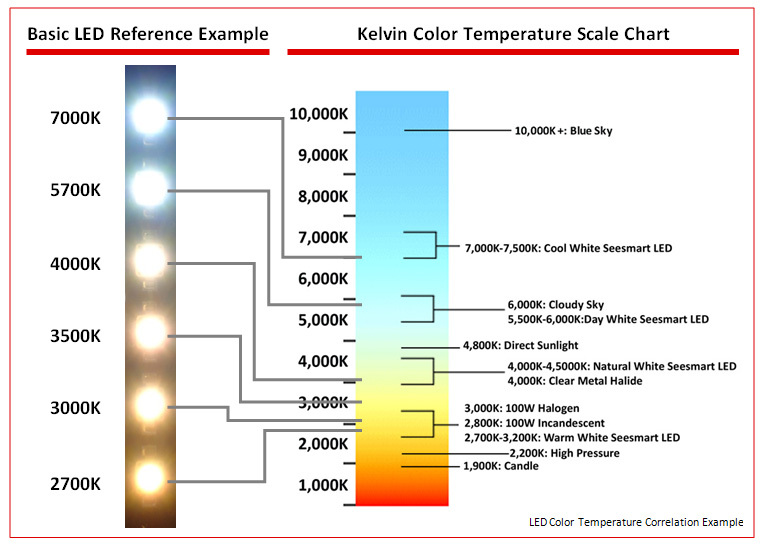 Have you ever seen a color temperature scale? When was the last time you've been in the lighting aisle at the hardware store? How can you never have seen a color temperature scale when it's on every light bulb box these days? Also I need to point out that your eyes adjust via auto-white balance, and colors are relative. These all appear WHITE by themselves. It is only by comparing one with another (or by taking notice on a regular basis) that a color difference becomes stark. I apologize for my incorrect terminology. I meant when looking at the two side by side, the 6200 K looks more blue than the 5400 K. And, to me, the 5400 K looks a warmer, or sort of red, when compared to the 6200 K. A lower color temperature would look even warmer. I can tell the difference without having to compare the two. Seems like nit picking to me. Interesting. You must hate 2700k then? I much prefer 5000-10000k, myself, but I'm in the minority there. I do dislike what is known as 2700 to 3000 K. It looks totally unnatural to me. There's a lot of space between 5000 and 10000 K. But, I think that was your point. It totally depends on application really. For domestic lighting i prefer the 'warm' 2700K or such lights. This is comparable to the light from old tungsten bulbs. Halogen bulbs would be close to 3000K which is still quite acceptable since they at least have a very good color rendering index. For things like retail stores and offices you may want to get the higher color temperatures, and for things like flashlights and car headlights you may prefer them as blue as possible. There also is the matter of efficiency if counted in lumens per watt: as our eyes are more sensitive to green light, the number would be better for a lamp that produced cold white light, if it converted the exact same amount of electrical power to optical power. There's a lot of space between 5000 and 10000 K. But, I think that was your point. There are a lot of integers between those two numbers, but it's a logarithmic response. The difference between 5000k and 10000k is less pronounced than between 2700k and 4000k. The difference between 10,000k and 30,000k would be less, still. And the difference between 30,000k and infinity Kelvin would be nearly zero. I was just saying I prefer cool white. Or what you might call "blue-white". I think 2700 K looks a lot like the old incandescent bulbs ( warm white ) and 5400 K - 6200 K are both pretty much ( bright white ). The Phillips Hue addressable RGB bulbs are great.